The International Stroke Conference 2018 — a 2½-day meeting Jan. 24-26 at the Los Angeles Convention Center in California — is dedicated to the science and treatment of cerebrovascular disease. The conference provides unique opportunities for you to meet and learn from colleagues with wide-ranging interests and expertise through a variety of educational sessions, from lectures to interactive training. Can you guess the correct answer before the timer runs out? Three teams of stroke professionals from around the world will test their knowledge in a game show-style competition. Those in the audience can play along using the ISC 2018 Mobile Meeting App. In this session dedicated to cerebrovascular education and discovery, leaders in the field will give short (18 minutes or less), powerful talks on innovative, engaging ideas about stroke research, education and policy. Thomas G. Brott, Jacksonville, Florida. Free Fallin’ – Can the Megadrop in Stroke Mortality Continue? 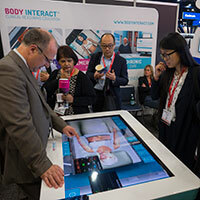 Body Interact is a screen-based 3-D immersive training platform that virtualizes acute and chronic neurovascular disorders with a lifelike patient. The simulation includes dynamic monitoring, dialoguing, diagnostic tests, medications, imaging, intervention options and performance debriefing. The Mentice VIST® G5 Simulator is a portable high-fidelity endovascular simulator enabling hands-on procedural training for clinicians and medical professionals. The modules include a wide variety of training scenarios to challenge the learner’s technical skills, clinical decision-making abilities and procedural proficiency. Learn about products and therapeutic treatments from industry supporters while you enjoy a complimentary lunch provided by the American Stroke Association.